In spinal cord injury (SCI) patients, no correlation was found between the number of bladder infections per year, the period since injury, the neurologic level of the spinal cord lesion and the histopathology of the urinary bladder mucosa. The use of chronic indwelling urethral and/or suprapubic catheters in SCI patients is often associated with inflammatory and proliferative pathological conditions in neuropathic bladder. We propose a hypothesis that the type of bladder drainage in SCI patients influences the histological changes in the mucosa of neuropathic bladder. This hypothesis implies that SCI patients with long-term indwelling urinary catheters develop certain histological changes in bladder mucosa, which are seen less frequently in SCI patients, who do not use long-term indwelling catheters. The latter group includes patients, who perform regular intermittent catheterisation and those, who wear a penile sheath and empty their bladders satisfactorily by reflex voiding. We hypothesise that the following histological lesions are seen more frequently in the neuropathic bladder of SCI patients with long-term indwelling catheters. As per this hypothesis, it is postulated that the above pathological conditions are seen less often in SCI patients, who achieve complete, low-pressure emptying of the neuropathic bladder by regular intermittent catheterisation, and SCI patients with penile sheath drainage, who empty their bladders satisfactorily by reflex voiding. A large prospective study of bladder biopsies in SCI patients practising different methods of bladder drainage is required to validate this hypothesis that the histological changes in bladder mucosa are related to the method of bladder drainage in SCI patients. We propose a hypothesis that the method of bladder drainage in SCI patients influences histological changes in the bladder mucosa. If this hypothesis is validated, methods of bladder drainage such as intermittent catheterisation, which do not require the use of chronic indwelling catheters, should be recommended, in order to minimise adverse histological changes in the mucosa of neuropathic bladder of spinal cord injury patients. Yalla  remarked that progressive structural changes in the bladder of a spinal cord injured (SCI) patient usually depend on the level and completeness of the cord lesion, duration of the lesion and rehabilitative management strategies. Delnay and associates  studied histological changes associated with chronic indwelling urinary catheter in 208 spinal cord injured patients. These patients had indwelling urethral and/or suprapubic catheters for more than 8.5 years. Squamous cell carcinoma was found in 10, transitional cell carcinoma in five and adenocarcinoma in two. Non-malignant mucosal changes in bladder biopsies included inflammation in 89%, cystitis glandularis in 17% and cystitis follicularis in 10%. Janzen and associates  reviewed 94 urinary bladder biopsies in patients with spinal cord injury and found no correlation between the number of bladder infections per year, the period since injury, the neurologic level of the spinal cord lesion and the histopathology of the urinary bladder mucosa. We propose a hypothesis that the type of bladder drainage in spinal cord injury patients may influence the histological changes in the mucosa of neuropathic bladder. This hypothesis implies that SCI patients with long-term indwelling urinary catheters develop certain histological changes in bladder mucosa, which are seen only rarely in SCI patients who do not use long-term indwelling catheters. The latter group includes SCI patients, who perform intermittent catheterisation and SCI patients, who wear a penile sheath and empty their bladders satisfactorily by reflex voiding. We postulate that chronic indwelling catheter drainage of neuropathic bladder is associated with certain histological changes in bladder mucosa in spinal cord injury patients. This hypothesis is based on our preliminary observations of bladder biopsies in SCI patients who practise intermittent catheterisation. We list below the histological changes, which are seen frequently in SCI patients with long-term indwelling catheters. These pathological conditions are seen less often in SCI patients, who are practising intermittent catheterisation consistently. 1. Papillary or polypoid cystitis refers to thin, finger-like papillae or broad-based polypoid lesions with prominent stromal oedema typically associated with chronic inflammation. The lesions are covered by urothelium that is usually normal but may be occasionally metaplastic. There is no cytological atypia. Papillary or polypoid cystitis represents urothelial response to chronic irritation caused by long-term indwelling catheters. (Figure 1). The aetiology of the mucosal changes observed in papillary/polypoid cystitis is inflammatory rather than neoplastic. 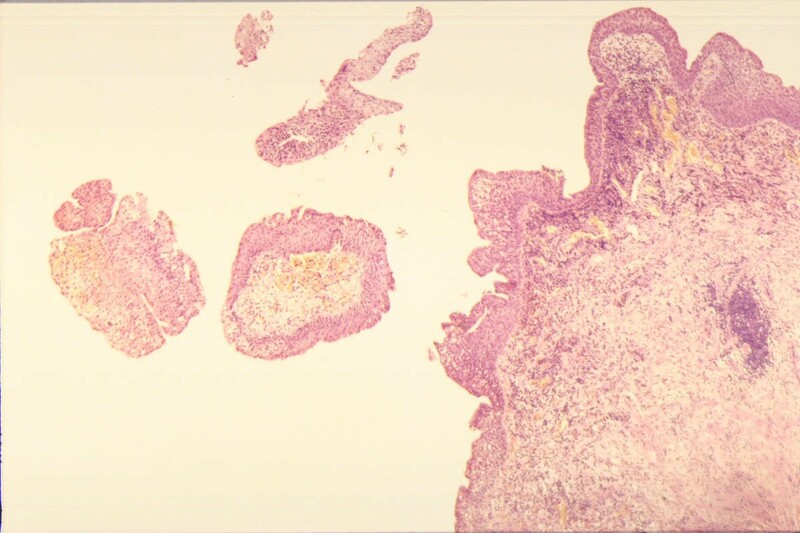 Photograph of urinary bladder biopsy (H-4268/98): A 54-year male with T-6 paraplegia has been managing the bladder by long-term indwelling urethral catheter. Histopathology shows papillary processes with inflamed fibrovascular cores. The epithelium covering these papillary processes show no cytological atypia. There is severe acute and chronic inflammation with incipient ulceration focally. 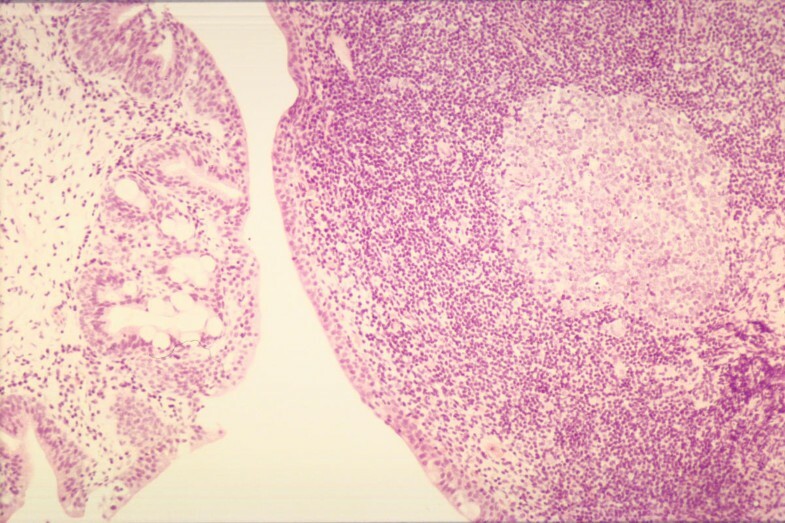 Large numbers of neutrophils are present within the surface urothelium. The presence of severe inflammation supports the diagnosis of papillary cystitis. 2. Follicular cystitis refers to the presence of lymphoid aggregates in submucosa with a germinal centre. Follicular cystitis is seen in the bladder biopsies of SCI patients with chronic infection. As SCI patients with long-term indwelling catheters often have chronic bladder infection, follicular cystitis is seen more frequently in the patients with long-term indwelling urinary catheters. (Figures 2). Similar changes may be seen in SCI patients who are on penile sheath drainage if they do not achieve satisfactory emptying of their bladders and consequently develop recurrent urinary infection. Although these SCI patients may not have chronic indwelling catheters, large residual urine in the neuropathic bladder and recurrent urinary infections predispose to changes in bladder mucosa, as observed in a 45-year old male with T-12 paraplegia. (Figure 3). We hypothesise that follicular cystitis occurs less frequently in SCI patients, who perform intermittent catheterisation consistently. SCI patients practising regular intermittent catheterisation are less likely to have recurrent or chronic bladder infection as compared to SCI patients with chronic indwelling catheters or, those with penile sheath drainage, who do not achieve satisfactory emptying of the neuropathic bladder. A prospective study of bladder biopsies in SCI patients practising intermittent catheterisation and those with chronic indwelling catheters will confirm or refute this hypothesis. Photograph of urinary bladder biopsy (H-4470/98): A 20-year male sustained C-4 complete tetraplegia two years ago when he fell off football goal post. He has chronic indwelling urethral catheter. 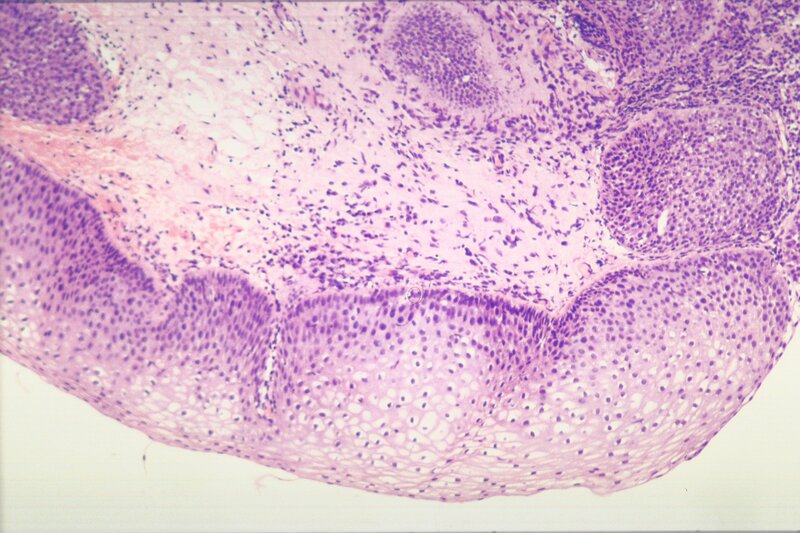 Histology shows severe chronic follicular cystitis. There is a large lymphoid follicle with germinal centre, occupying most of the stroma of the biopsy. Elsewhere, there is light scattering of lymphocytes and plasma cells. There is no ulceration of surface urothelium. Photograph of bladder biopsy (HP-4450/98): A 45-year old male with paraplegia was on penile sheath drainage. He had to bang his stomach to empty the bladder. He had recurrent urinary infections. A staghorn calculus was detected in left kidney during annual review. Cystoscopy revealed mucky, purulent, urine in the bladder. Histology of bladder biopsy revealed moderate to marked chronic inflammation with a minor acute inflammatory component also. The chronic inflammation was predominantly follicular in nature with large lymphoid aggregates including germinal centres, thus giving a diagnosis of follicular cystitis. There was marked cystitis glandularis and focal microcalcification. 3. Cystitis glandularis is a proliferative disorder of bladder mucosa. 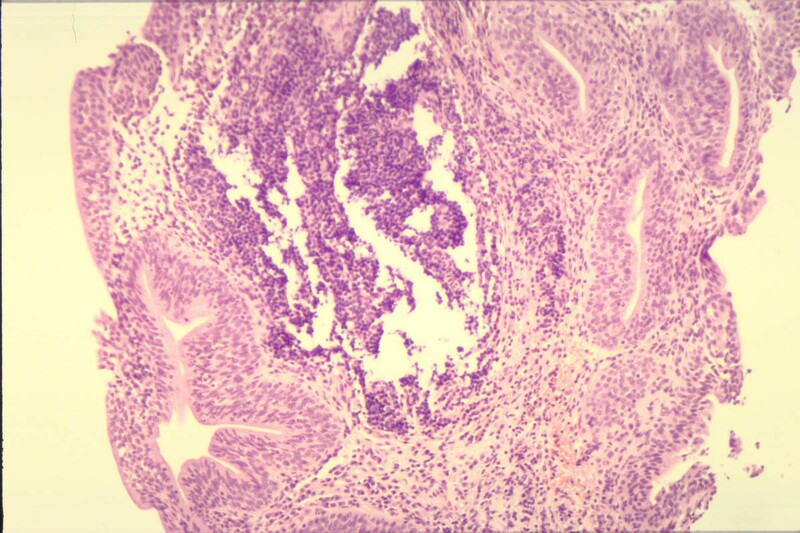 The bladder mucosa shows the presence of Brunn's nests with or without cysts, which are often accompanied by columnar epithelial metaplasia. The glandular structures closely resemble the colonic crypts. 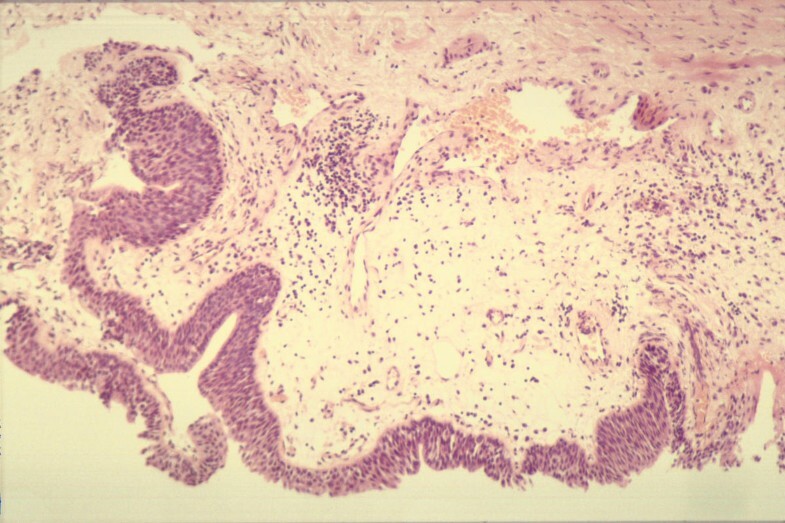 Histochemical studies demonstrate glandular lesions in the bladder secrete colonic type mucin, and endocrine cells are positive with Grimelius' staining. Cystitis glandularis is seen often in SCI patients with long-term indwelling catheters. (Figures 4 and 5). As mentioned above, Delnay and associates  found cystitis glandularis in 36 of 208 (17%) spinal cord injured patients with indwelling urethral and/or suprapubic catheters for more than 8.5 years who underwent bladder biopsy. It is believed that widespread cystitis glandularis may be a premalignant condition. . In five large series of bladder adenocarcinoma, metaplastic cystitis glandularis was associated with malignancy in 10 to 42% of cases. . The hypothesis proposed by us implies that cystitis glandularis occurs more frequently in SCI patients with chronic indwelling urinary catheters and it is observed less often in bladder mucosal biopsies taken from SCI patients who manage their bladder by intermittent catheterisation, performed consistently. A corollary to this hypothesis is that widespread cystitis glandularis is seen mainly in SCI patients with chronic indwelling urethral and/or suprapubic catheters, and rarely in SCI patients who have been practising regular intermittent catheterisation and are free of urinary infections. A prospective study of bladder biopsies is required to validate this hypothesis. Photograph of bladder biopsy (H-3411/98): A 53-year old male sustained C-5 tetraplegia in a car accident 23 years ago. He has chronic indwelling urethral catheter. Histology shows bladder mucosa covered by predominantly metaplastic epithelium. Only a small amount of normal urothelium is present. The metaplastic epithelium consists of pseudo-stratified columnar cells, with occasional interspersed goblet cells but without cilia. This probably represents a stage in the development of intestinal metaplasia. The stroma contains acute and chronic inflammatory infiltrate. 4. Moderate to severe, acute and chronic inflammatory changes in bladder mucosa: The spectrum of inflammatory changes seen in the mucosa of neuropathic bladder appears to be related to the presence or absence of long-term indwelling catheters. The degree and extent of inflammatory changes in the bladder mucosa of patients with SCI, who have been practising intermittent catheterisation are markedly less (Figure 6), as compared to the biopsies taken from the neuropathic bladder of SCI patients with long-term indwelling catheters. (Figure 7). Wall and associates  obtained mucosal biopsies from 37 adults with spinal cord injury. All participants had required a chronic indwelling urethral or suprapubic catheter for greater than 8 years. 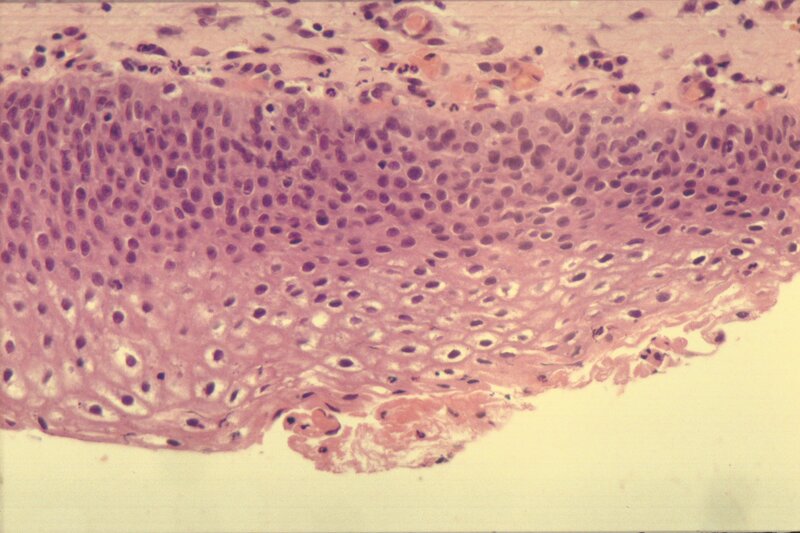 Histopathological studies revealed active inflammatory infiltrates in all 37 biopsy specimens. Immunohistochemistry revealed the presence of inducible nitric oxide synthase in inflammatory cells, which were localised to the lamina propria. Inducible nitric oxide synthase positive cells were identified as macrophages using monoclonal antibodies to macrophage antigen. A prospective study of bladder biopsies will identify the true incidence of severe inflammatory changes in bladder mucosa in SCI patients with chronic indwelling catheters and in those who perform regular intermittent catheterisation. Photograph of bladder biopsy (H-6004/98): This 18-year old male sustained T-5 paraplegia in a car accident eighteen months ago. He manages his bladder by intermittent catheterisation. He developed bladder stones of unusual shape. The nidus of these stones was hair. Most probably, genital hair was introduced inadvertently into the bladder during self-catheterisation. Histology shows mild chronic inflammation only. There is no acute inflammation or ulceration. The inflammatory infiltrate consists mainly of lymphocytes with occasional plasma cells and mast cells, which is rather patchy and confined to the sub-epithelial zone. 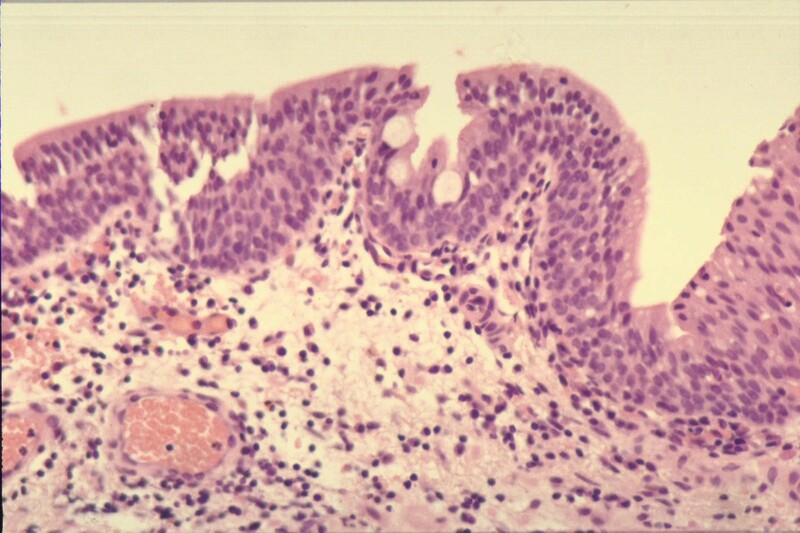 Only occasional lymphocytes are present within the urothelium, which is mildly hyperplastic. There is no squamous metaplasia and no evidence of dysplasia. There is also mild oedema and congestion, which may be due to bladder stones. Photograph of bladder biopsy (H-3640/97): This 49-year old lady developed C-4 tetraplegia three years ago. Since then she has been on long-term indwelling urethral catheter drainage. She developed bladder stone. Histology shows severe acute and chronic inflammation with ulceration. The inflammatory infiltrate includes numerous suburothelial lymphoid follicles. There is focal cystitis glandularis. 5. Squamous metaplasia: Delnay and associates  found non-keratinising squamous metaplasia in 47% of biopsies taken from SCI patients with chronic indwelling urethral and/or suprapubic catheters; keratinising squamous metaplasia was seen in 6% of biopsies. Squamous metaplasia is a common result of chronic bladder irritation or infection. Kaufman and associates  reportedsquamous metaplasia in 80% of patients catheterised for more than 10 years compared to 42% catheterised for less than 10 years and 20% in spinal cord injury patients without long-term indwelling catheters. We observed squamous metaplasia in vesical mucosa of three groups of SCI patients: (1) SCI patients with long-term indwelling urinary catheters (Figures 8); (2) those with bladder calculi; (3) SCI patients with recurrent urinary infection. Keratinising squamous metaplasia was seen only in those patients with chronic urethral and/or suprapubic catheters. We did not observe keratinsing squamous metaplasia in spinal cord injury patients who did not have long-term catheters. We hypothesise that squamous metaplasia occurs less often in bladder biopsies of SCI patients, who started practising intermittent catheterisation soon after they recovered from acute effects of spinal cord trauma and who do not suffer from recurrent urinary tract infections. In contrast to SCI patients practising intermittent catheterisation, SCI patients, who have chronic indwelling urethral and/or suprapubic catheters are more likely to develop squamous metaplasia. A large, prospective, histological study of bladder biopsies in SCI patients is needed to confirm or disprove this hypothesis. Photograph of bladder biopsy (HP00/4013): A 56-year male with T-6 paraplegia has been managing the bladder by long-term indwelling urethral catheter. Histology shows moderate to severe superficial, acute and chronic inflammation without ulceration. Polymorphs extend into the overlying urothelium. 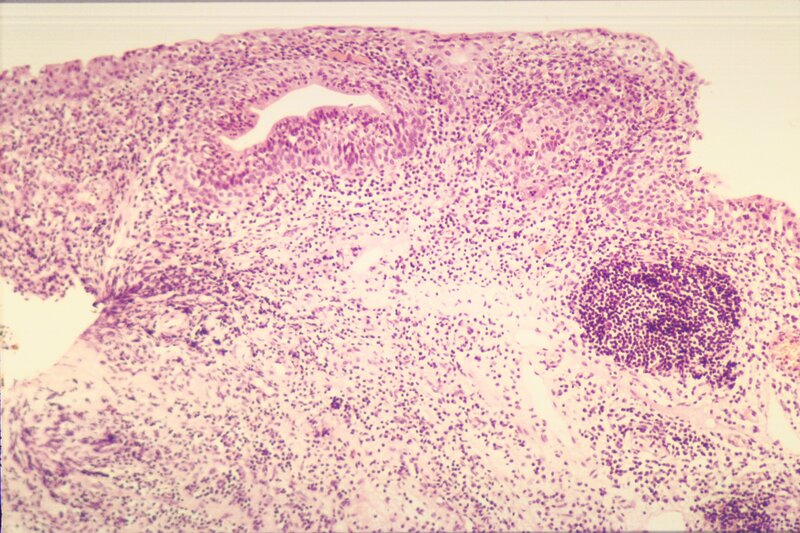 A lymphoid follicle with germinal centre is included in the mucosa. Approximately one-third of the surface epithelium shows non-keratinising squamous metaplasia. 6. Urothelial dysplasia: Urothelial dysplasia was seen in SCI patients with chronic urethral and/or suprapubic catheters. (Figure 9). Our assumption is that urothelial dysplasia occurs rarely in SCI patients, who have been performing intermittent catheterisation and who did not require long-term indwelling catheters. It is reasonable to postulate that chronic indwelling catheters, recurrent bladder stones, and frequent episodes of cystitis contribute to development of urothelial dysplasia in neuropathic bladder. . A prospective study is required to confirm or refute this hypothesis that urothelial dysplasia occurs less often in SCI patients, who manage their bladders without chronic indwelling catheters as compared to SCI patients with long-term indwelling urethral and/or suprapubic catheters. Photograph of bladder biopsy (H-5554/99): This 28-year old male developed C-4 complete tetraplegia in a car accident four years ago. He has been on suprapubic catheter drainage for four years. He developed a stone in urinary bladder. Histology shows the bladder mucosa is covered almost entirely by mature, metaplastic squamous epithelium, with only a small amount of transitional epithelium remaining. The squamous epithelium is predominantly non-keratinising. But there are small foci of keratinisation. There is mild dysplasia as well. A large prospective study of bladder biopsies in SCI patients practising different methods of bladder drainage is required to validate this hypothesis that histological changes in bladder mucosa are related to the method of bladder drainage in SCI patients. The drainage of neuropathic bladder by long-term indwelling catheters may be associated with histological changes in bladder mucosa, which include polypoid cystitis, follicular cystitis, widespread cystitis glandularis, and moderate to severe degree of acute and chronic inflammation. Inducible nitric oxide synthase is expressed in inflammatory macrophages in areas of chronic inflammation in the bladder mucosa of spinal cord injured patients with a chronic indwelling bladder catheter. The expression of inducible nitric oxide synthase may potentially lead to the sustained production of nitric oxide and its oxidative products, the nitrosation of urinary amines and the formation of potentially carcinogenic nitrosamines in the bladder . Delnay and associates  recommended that every effort should be made to eliminate ongoing causes of inflammation in SCI patients with squamous metaplasia. SCI patients should be treated with intermittent catheterisation and bladder stones should be removed promptly when identified, as continuing inflammatory insult may eventually result in malignancy. A corollary to this hypothesis is whether the lesions in bladder mucosa associated with chronic indwelling catheters are reversible if the method of bladder drainage is changed, say, from indwelling catheter drainage to intermittent catheterisation regime. We do not know as yet, whether the histological changes in the bladder mucosa associated with chronic indwelling catheters in SCI patients are permanent. We are unsure whether all histological changes observed in bladder biopsies of SCI patients, who have been on long-term indwelling urethral and/or suprapubic catheters, will resolve if these patients modify the method of bladder drainage and discard indwelling catheters. We believe that inflammatory changes in bladder mucosa might subside over a period of time, if a SCI patient practises intermittent catheterisation instead of using long-term catheter drainage of neuropathic bladder. It is rather unlikely that proliferative changes such as widespread cystitis glandularis will disappear completely if chronic indwelling catheter drainage is replaced by intermittent catheterisation regime. A longitudinal study of SCI patients, in whom bladder biopsies are taken sequentially when the method of bladder drainage is changed, will show whether the histological changes in bladder mucosa remain indefinitely or will revert to normal. If the longitudinal study shows that adverse histological lesions in bladder mucosa associated with chronic indwelling catheters are irreversible or, only partially reversible, this would have great relevance to clinical practice. We should then discuss with SCI patients and their carers, the need to shift to intermittent catheterisation from indwelling catheter drainage of neuropathic bladders as soon as possible, in order to prevent adverse histological changes in bladder mucosa. We hypothesise that the following histological lesions are seen more frequently in SCI patients with long-term indwelling catheters. As per this hypothesis, it is postulated that the above pathological conditions are seen less often in SCI patients, who achieve complete, low-pressure emptying of the neuropathic bladder by regular intermittent catheterisation, carried out consistently, and SCI patients with penile sheath drainage, who empty their bladder satisfactorily by reflex voiding. 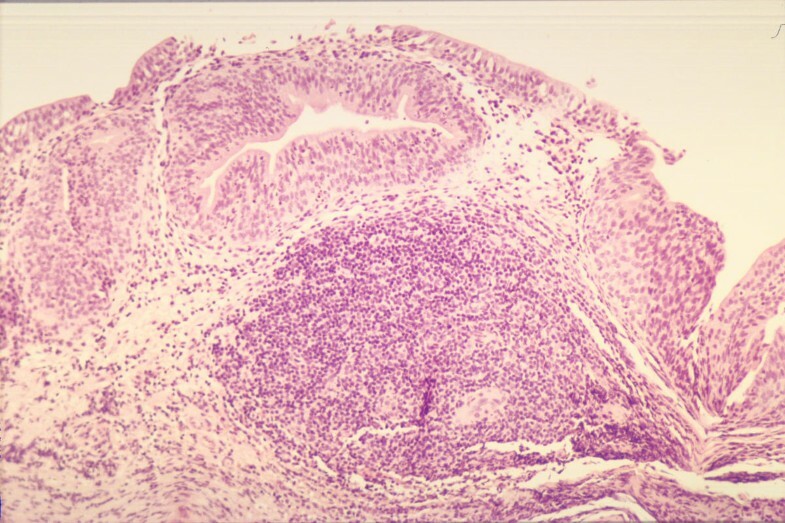 A prospective study of bladder biopsies in SCI patients is needed to confirm or refute the hypothesis that method of bladder drainage influences histological changes in bladder mucosa. If this hypothesis is validated, methods of bladder drainage such as intermittent catheterisation, which do not require the use of chronic indwelling catheters, should be recommended, in order to minimise adverse histological changes in the mucosa of neuropathic bladder of spinal cord injury patients. We thank AstraZeneca (Ms Charlotte Lawledge), Pharmacia (Ms Joanne Thomas), and Shire Pharmaceuticals (Mr Patrick Tierney) for financial support, which enabled the Regional Spinal Injuries Centre, Southport, UK to become an institutional member of BioMed Central. All authors provide medical care to spinal cord injury patients. The authors are committed to prevention of adverse histological changes in the mucosa of neuropathic bladder of spinal cord injury patients. SV developed the concept, formulated the hypothesis and wrote the manuscript. PM interpreted histopathology slides of bladder biopsies. SV and GS carried out bladder biopsies in spinal cord injury patients. All authors contributed to the final version of the manuscript.